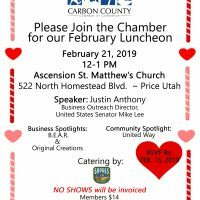 The Carbon County Chamber of Commerce would like to invite individuals to their February Luncheon on Thursday, February 21 at 12:00 pm to 1:00 pm at Ascension St. Matthew’s Church located at 522 North Homestead Boulevard. The cost to attend is $14.00 per member and $20.00 non-members, keep in mind that any no-shows will be billed. The luncheon will be catered by Grogg’s Pinnacle Brewing. Guest speaker will be Justin Anthony who is the Business Outreach Director, United States Senator Mike Lee. There will be two businesses featured for the Business Spotlights, the Business Expansion and Retention (BEAR) program which is a community-wide effort to support, grow and enhance the economic impact of existing business and Original Creations who has the largest collection of mining-related bronze sculptures and specializes in one of kind sculptures, engravings, trophies, plaques and metal work. Community Service Spotlight is on United Way of Eastern Utah. To RSVP for the luncheon please contact the chamber office at (435) 637-2788.